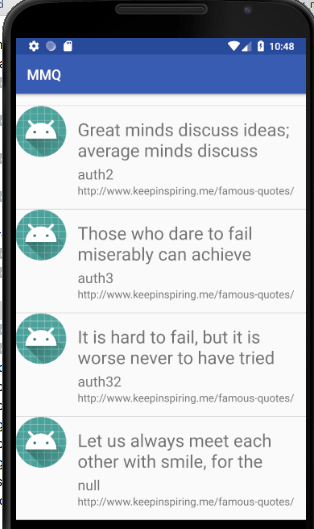 If you have ever programmed any application that requires database, and you came up with solution to use SQLite then you may already be familiar as how much pain it is to use and properly configure SQLite in Android. Anko provides a better way to do this complex task in a very simpler way. For further reading and using this sqlite wrapper can check its official documentation. Which provides very easy and complete way of using this library. In this post we are going to implement an Application which could be used to save favourite quotes. For this we are using SQLite database that will be helpful for us to save quotes and latter on retrieve it. According to our above mentioned requirements there could be number of ways to implement this thing. But we will make this as simple as possible. Because here, our core requirement is to understand Anko-SQLite wrapper library and to use SQLite in efficient way in kotlin. So let’s get started. After that your project will start compiling all the default resources. 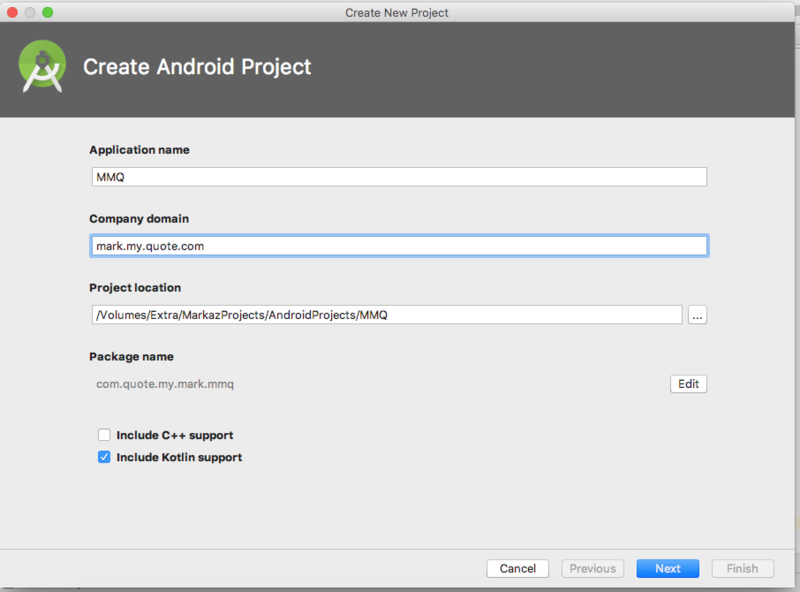 Once everything is ready then goto your app level gradle file and import above mention anko-sqlite gradle implementation and rebuild project again. Also add anko common gradle import. Here are some points that is notable, first is that we created auto incremental id filed which could not be null. Second quote text filed will be used to add text of the actual quote which is text formate and author, source and creationdate fields are also of type text. finally isfavourite filed is Integer type which is going to save data in 0 or 1 type, indicating not favourite and favourite respectively. Anko provides a very efficient and managed Helper class called ManagedSQLiteOpenHelper You just need to extend this class and create your own helper class in kotlin. So let’s just do it. First of all create a separate package of name databases so that we could separate our database logic from application level logic. Goto your project java folder open up your right click on your java folder then New->package, name your package and click OK. After that you will see a new package in your project structure. Right click on that and then select a new Kotlin Class. After that from appeared dialog box select Kotlin and name your helper class. In my case I had selected the name as QuoteDBHelper. The best way to implement model class for database and for many other uses is to create a data class. Here is official data class documentation in case if you want to understand it further. Let’s create a separate package for our Model classes and lets just call it Models. You can do this same like before you created package for database related tasks. Once you created separate package for models, then just create a new Data class under that package and name it as Quote. If you had already noticed that we created only id field nullable. Leave this class for now as it is, and we will come it to later if we need. You can read more about ListView from android documentation. Although Listviews are deprecated but we will focus on this just to keep simplicity and assuming that our list is not gonna be so large. Here is one more example of Listview usage. The next step that we are going to do is to create a simple ArrayList of Strings so that we could check if our list view is working properly or not. 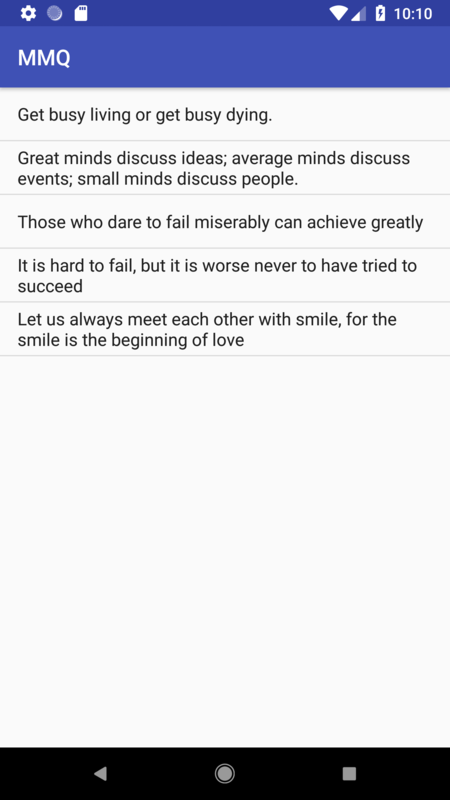 So we choose few of quotes from KeepInspiring.com and created list as per following. 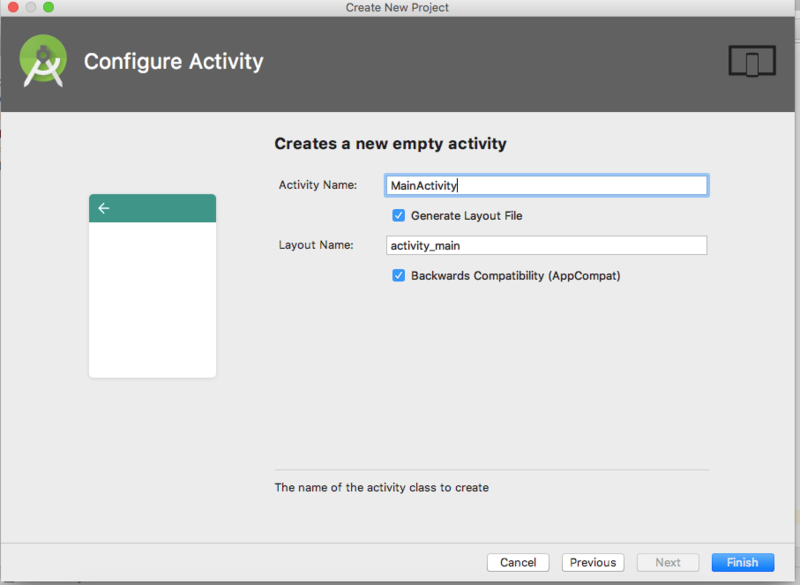 We also set adapter with simple list item layout in onCreate method of MainActivity Class. Lets try to run application on simulator or actual device to ensure that everything is working so far. Because everything is working as expected now let’s try to extend Adapter class so that we will be able to display more information onto ListView instead of just displaying static strings. Hope you remember so far that we need to use our model Quote class to build the ListView. The data adapter class is used to get data from any source and build view for that data accordingly. Now we will create a dummy list of quotes and will replace the previous default data adapter of ListView as follows. Is it possible to use this framework to read from a database that I ship with my app? Yes, You can read database from Assets folder so just put your sqlite database file in assets folder and read that database.